Castle Comfort Stairlifts offers top brand stairlifts, keen prices and fast installs for all those seeking stairlifts in Scunthorpe, Lincolnshire . Castle Comfort Stair Lifts has arrived in Scunthorpe, Lincolnshire. Scunthorpe is in the very north of the county almost 30 miles north of Lincoln and just 15 miles south of the Humber estuary. We bring our stairlift offers of top brands as agents for the leading stairlift manufacturers with a choice to suit you. Our service is independent and personal. We offer fast installation and 24 hour service and support, plus a local office where you can discuss your requirements that can be contacted on 01522 889 769. Scunthorpe has somewhere in the region of 400 retired folk who already own stairlifts and according to statistics we get a lot of visitors on our website from here. · Kevin Keegan who went on to become an England football player and England Manger, started his footballing career playing for Scunthorpe United too. · Football manager Graham Taylor who grew up in the town spent time watching Scunthorpe United before joining Grimsby Town and Lincoln City as a player. · Other well known football players from the area or with connections include Jack Bowers, Allan Clarke, Ray Clemence and Keith Lindsay. · Another sportsman with Scunthorpe connections – he was born and grew up there – is international golfer Tony Jacklin. He was the first British player to win the Open Championship for 18 years and went on to win the US Open, the first time a European player had won in 84 years. · Scunthorpe has also spawned a few well-known actors too. Dame Joan Plowright was born in nearby Brigg; she was famously married to Sir Laurence Olivier; her acting career has spanned 60 years and she has a long list of film credits to her name. She also won 2 Golden Globes, an Oscar, a Tony, an Emmy and two BAFTAs. The Plowright Theatre in Scunthorpe is named after her. 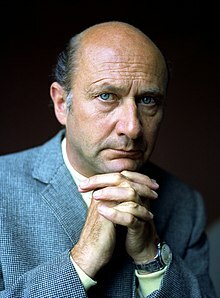 · Actor Donald Pleasance who had a notable career in TV, theatre and film grew up in Scunthorpe. · More loveys from the area include Kevin Doyle (Moseley in Downton Abbey); Liz Smith well known latterly for her role as Nana in the Royle Family; and Sheridan Smith (no relation) well known for her part in Two pints of Lager and a Packet of Crisps. Sheridan was last year’s winner of the Laurence Olivier Award for Best Actress in a Musical for her performance in Naturally Blonde and also the Natasha Richardson Award for Best Actress for her part in Flare Path both on the West End stage. Local author Ted Lewis featured Scunthorpe in his series of novels which were made into films starring Michael Caine during the 1960’s. The books were all about gangster life of the period. One of the stories, Jack’s Return Home later released as Get Carter, showed gangster Jack Carter returning to Scunthorpe from London after his brother’s death with the aim of revenge. The film location was actually shot on Tyneside. The actual story was based on a true one – known as the one-armed bandit murder - a fruit machine cash collector from Sunderland, Angus Sibbet. No need to gamble on your attempts to make it up and down the stairs! We can give you your independence back with a stair or chairlift to suit. Stairlifts also help to reduce the risk of accidents on the stairs as we get frailer and less able to cope with this necessary access to another level. We can supply straight, curved or perch stairlifts. The first two depend entirely on the sort of staircase you have whilst the third is deigned for those of you unable to bend your knees for whatever reason. We can assess just what you need and also offer fair stairlift prices. We even have reconditioned stairlifts available. If you’re concerned about how you can fund this, have a look at the opportunities for grants or 0% finance. Of course you can also call us for advice on 01522 889 769 . Scunthorpe was made up of five villages – Scunthorpe, Frodingham, Crosby, Brumby and Ashby – all of which joined together to form the larger conurbation of Scunthorpe. The area is rich in iron ore and limestone both are crucial components for manufacturing steel. This was an important part of Scunthorpe’s industry but by the 1980’s all the local mines were closed and British Steels closed all operations in the UK. Ironstone was mined here way back during the Roman occupation and the iron ore deposits were only rediscovered in the 19th century. During its heyday of steel production Scunthorpe had the largest steel processing plant in the UK and was known as the Industrial Garden Town. Steel production is still a big part of Scunthorpe’s industry mainly with Corus, the Indian owned company; industrial gas is also produced in the area. Engineering, food production and distribution account for other major industries in Scunthorpe. In 2008, a significant earthquake – 5.2 on the Richter scale – caused Scunthorpe to experience shock waves. This was one of the largest earthquakes ever experienced in the UK. There are a few more famous names connected with Scunthorpe; these include Howard Devoto singer with the Buzzcocks and Magazine; Danny Flynn a science fiction and fantasy artist; the convicted murderer Ian Huntley also lived in Scunthorpe at one time. Scunthorpe United is the breeding ground for many of our footballers. The club was formed in 1899 and is knick-named The Iron. More recent players include Jermaine Beckford, Andy Keogh, Billy Sharp and Gary Hooper. 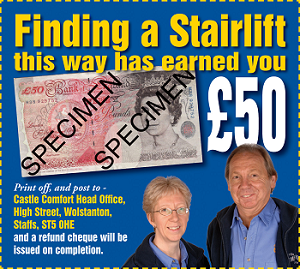 Don’t forget if you are looking for a stairlift for yourself or a loved one, we can help. 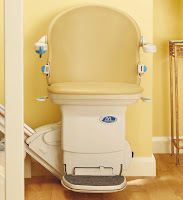 At Castle Comfort Stair Lifts we have more than 14 years of experience and are well placed to advise you. For any questions you might have about stairlifts, their installation and their on-going maintenance please give your local office a call on 01522 889 769 .